I’ve been a world traveler all my life. I was born in Nairobi, Kenya, where I lived until the age of ten. My family moved to Delhi, India, and three years later, we all moved to London, England. In 1972, the course of my life changed yet again and I relocated to Shawnee, Oklahoma. I’ve been an artist all my life. I always drew pictures when I was younger, but I did not seriously pursue painting and pottery until I was well into my 30s. I opened an art school (first called The Art Getaway and then Sitara Art) in the 1980s and early 1990s. Reina was an integral part of helping me run the school, serving as my co-teacher and all-around scutworker. After a brief adventure in the islands off the coast of Canada, I opened my gift gallery Starry Starry Arts in 1999. This time, Mahesh was my trusted lieutenant and scutworker, and the business prospered until 2006, when I moved to Oklahoma City to build my Feng Shui consultancy. I am the mother of two wonderful children, my son Mahesh and my daughter Reina. My daughter lives in Oklahoma City; for several years, I lived 20 minutes away from her. I live in Oregon now, and my son is (you guessed it) 20 minutes from my house. The Universe has a sense of symmetry! My son lives with his wife Sara and my beautiful granddaughter Nina. As any grandparent can understand, my granddaughter was a major reason for my move. But it wasn’t an easy decision. Oklahoma was my home for more than 40 years. I miss all of the dear friends I made over the past several decades, and I obviously miss being near to my wonderful daughter. I’ve prepared a special room in my home just for her. Although I left Oklahoma with a heavy heart, I’m looking forward to watching my granddaughter grow up and spending time with my son and daughter-in-law. And I’m excited to make new lifelong friends here in Oregon. As you might have guessed, I’ve been interested in Feng Shui for many years. I studied Feng Shui with several family friends who had migrated from Hong Kong. I noticed that Feng Shui was similar to an ancient Vedic aesthetic practice that my Mom had taught me. I began practicing Feng Shui with family members, and I quickly realized the impact of auspicious placement of objects and furniture had on people. For me, life has always been an adventure. I can’t wait to see what I do next! Here’s a timely summer tip for saving water: add a layer of mulch around your trees and plants. Chunks of bark, peat moss, or gravel slow evaporation of water. This will save you more than 750 gallons of water per month, thus saving precious water and money! Sunita is magical yet firmly grounded in daily life. Her astute intuition supports people as they journey through life transitions. 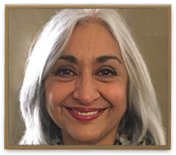 Sunita is deeply rooted in human ecology and seeks to help people find harmony in their relationships with others, their communities and their created environment. Sunita has graced my life for more than 20 years and I know if you meet her, you will be changed by her caring and knowledgeable presence.